Mike Nugent's 42-yard field goal in overtime nearly gave every Bengals fan a heart attack. Mike Nugent's game-winning field goal in overtime Sunday banked in off the left upright, but you would never know it listening to the radio call. The spectators at Paul Brown Stadium were on the edge of their seats as Nugent's 42-yard kick handed Cincinnati a 27-24 win over the Seahawks. 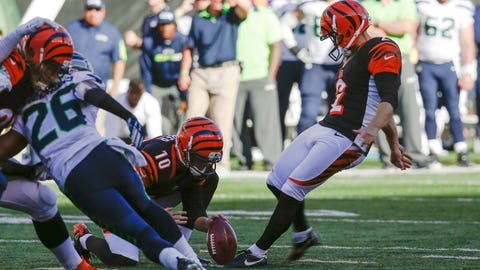 The fans listening to Bengals radio announcer Dan Hoard's call on the radio were equally anxious, but they also had probably had no idea how close the kick was to missing the mark. You can barely hear the doink of the ball, but you can certainly hear Hoard screaming with excitement about the dramatic come-from-behind victory.